This visible image from NOAA's GOES-13 satellite shows the remnant clouds from Sandy at 1:31 p.m. EDT on Nov. 2, 2012. 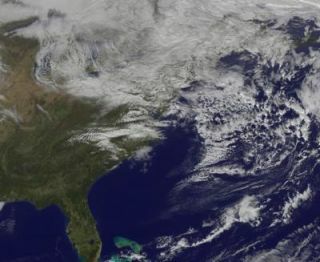 While residents in the New York area continued to dig out from Hurricane Sandy’s destruction, the superstorm’s residual clouds hung over the Northeast and Canada. NOAA’s GOES-13 satellite snapped this picture of what's left of the storm from space on Friday (Nov. 2) at 1:31 p.m. EDT (1731 GMT). The massive cloud cover, which has lost its spiral shape, lingers over the Great Lakes, east to New England and north into Canada. Sandy was a Category 1 hurricane as it barreled into the coast of New Jersey on Monday (Oct. 29), packing winds of up to 90 mph (145 kph). The storm then became a post-tropical cyclone and merged with a cold front to become a hybrid nor'easter. The superstorm brought record flooding to New York City, destroyed towns along the New Jersey coastline and even dumped feet of snow on some places further inland, such as West Virginia. The National Weather Service projects that the low-pressure area made up of Sandy's remains will roll off shore by Monday, Nov. 6. Follow SPACE.com on Twitter @Spacedotcom.We're also on Facebook and Google+.